For other uses, see Tar (disambiguation). 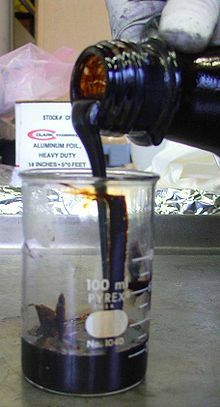 Tar is a dark brown or black viscous liquid of hydrocarbons and free carbon, obtained from a wide variety of organic materials through destructive distillation. Tar can be produced from coal, wood, petroleum, or peat. Production and trade in pine-derived tar was a major contributor in the economies of Northern Europe and Colonial America. Its main use was in preserving wooden sailing vessels against rot. The largest user was the Royal Navy of the United Kingdom. Demand for tar declined with the advent of iron and steel ships. Tar-like products can also be produced from other forms of organic matter, such as peat. Mineral products resembling tar can be produced from fossil hydrocarbons, such as petroleum. Coal tar is produced from coal as a byproduct of coke production. "Tar" and "pitch" can be used interchangeably; asphalt (naturally occurring pitch) may also be called either "mineral tar" or "mineral pitch". There is a tendency to use "tar" for more liquid substances and "pitch" for more solid (viscoelastic) substances. Both "tar" and "pitch" are applied to viscous forms of asphalt, such as the asphalt found in naturally occurring tar pits (e.g., the La Brea Tar Pits in Los Angeles) . "Rangoon tar", also known as "Burmese oil" or "Burmese naphtha", is also a form of petroleum. Oil sands, almost exclusively produced in Alberta, Canada, are colloquially referred to as "tar sands" but are in fact composed of bitumen. Note, similar heavy crude grades from Venezuela are not referred to as "tar sands" by Wikipedia or the environmental community. In Northern Europe, the word "tar" refers primarily to a substance that is derived from the wood and roots of pine. In earlier times it was often used as a water repellent coating for boats, ships, and roofs. It is still used as an additive in the flavoring of candy, alcohol, and other foods. Wood tar is microbicidal. Producing tar from wood was known in ancient Greece and has probably been used in Scandinavia since the Iron Age. For centuries, dating back at least to the 14th century, tar was among Sweden's most important exports. Sweden exported 13,000 barrels of tar in 1615 and 227,000 barrels in the peak year of 1863. Production nearly stopped in the early 20th century, when other chemicals replaced tar, and wooden ships were replaced by steel ships. Traditional wooden boats are still sometimes tarred. The heating (dry distilling) of pine wood causes tar and pitch to drip away from the wood and leave behind charcoal. Birch bark is used to make particularly fine tar, known as "Russian oil", suitable for leather protection. The by-products of wood tar are turpentine and charcoal. When deciduous tree woods are subjected to destructive distillation, the products are methanol (wood alcohol) and charcoal. 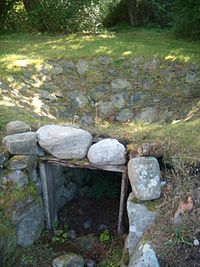 Tar kilns (Swedish: tjärdal, Danish: tjæremile, Norwegian: tjæremile, Finnish: tervahauta) are dry distillation ovens, historically used in Scandinavia for producing tar from wood. They were built close to the forest, from limestone or from more primitive holes in the ground. The bottom is sloped into an outlet hole to allow the tar to pour out. The wood is split into dimensions of a finger, stacked densely, and finally covered tight with dirt and moss. If oxygen can enter, the wood might catch fire, and the production would be ruined. On top of this, a fire is stacked and lit. After a few hours, the tar starts to pour out and continues to do so for a few days. Tar was used as seal for roofing shingles and tar paper and to seal the hulls of ships and boats. For millennia, wood tar was used to waterproof sails and boats, but today, sails made from inherently waterproof synthetic substances have reduced the demand for tar. Wood tar is still used to seal traditional wooden boats and the roofs of historical shingle-roofed churches, as well as painting exterior walls of log buildings. Tar is also a general disinfectant. Pine tar oil, or wood tar oil, is used for the surface treatment of wooden shingle roofs, boats, buckets, and tubs and in the medicine, soap, and rubber industries. Pine tar has good penetration on the rough wood. An old wood tar oil recipe for the treatment of wood is one-third each genuine wood tar, balsam turpentine, and boiled or raw linseed oil or Chinese tung oil. In Finland, wood tar was once considered a panacea reputed to heal "even those cut in twain through their midriff". A Finnish proverb states that "if sauna, vodka and tar won't help, the disease is fatal." Wood tar is used in traditional Finnish medicine because of its microbicidal properties. As a flavoring for candies (e.g., Terva Leijona) and alcohol (Terva Viina). As a spice for food, like meat. As a scent for saunas. Tar water is mixed into water, which is turned into steam in the sauna. As an anti-dandruff agent in shampoo. As a component of cosmetics. Mixing tar with linseed oil varnish produces tar paint. Tar paint has a translucent brownish hue and can be used to saturate and tone wood and protect it from weather. Tar paint can also be toned with various pigments, producing translucent colors and preserving the wood texture. In English, German, and French, "tar" is a substance primarily derived from coal. It was formerly one of the products of gasworks. Tar made from coal or petroleum is considered toxic and carcinogenic because of its high benzene content, though coal tar in low concentrations is used as a topical medicine. Coal and petroleum tar has a pungent odour. ^ Daintith, John (2008). tar. Oxford University Press (6th ed.). doi:10.1093/acref/9780199204632.001.0001. ISBN 9780199204632. "Tar: Definition". Miriam Webster. Retrieved 14 March 2013. "a dark brown or black bituminous usually odorous viscous liquid obtained by destructive distillation of organic material (such as wood, coal, or peat)". "tar and pitch" (6th ed.). The Columbia Electronic Encyclopedia. Retrieved 14 March 2013. "tar and pitch, viscous, dark-brown to black substances obtained by the destructive distillation of coal, wood, petroleum, peat, and certain other organic materials. " ^ Burger, Pauline. "Ancient maritime pitch and tar a multi-disciplinary study of sources, technology and preservation". British Museum. Retrieved 14 March 2013. ^ "tar and pitch" (6th ed.). The Columbia Electronic Encyclopedia. Retrieved 14 March 2013. "The terms tar and pitch are loosely applied to the many varieties of the two substances, sometimes interchangeably. For example, asphalt, which is naturally occurring pitch, is called mineral tar and mineral pitch. Tar is more or less fluid, depending upon its origin and the temperature to which it is exposed. Pitch tends to be more solid." ^ "Oil sands". 13 December 2018 – via Wikipedia. ^ "Don't call them 'tar sands' - Macleans.ca". www.macleans.ca. ^ "Alberta's oil sands crude: the science behind the debate" – via The Globe and Mail. ^ "Orinoco Belt". 15 September 2018 – via Wikipedia. Look up tar, pitch, asphalt, or bitumen in Wiktionary, the free dictionary. ^ "Geotimes – February 2005 – Mummy tar in ancient Egypt". Retrieved January 9, 2006. Wikimedia Commons has media related to Tar.